What does a heater valve do? The heater control valve regulates, by opening or closing, the amount of hot water that enters the heater coil. Why restore or replace your heater valve? A good indication that your heater control valve is failing is if your air conditioning is functioning correctly and your system gauge readings are correct, but you’re getting heat or warm air out of the vents. This could be as a result of a failed heater control valve that will not shut off the flow of water to your heater coil. The heater control valve can also fail by leaking, or even by not opening and allowing water to flow into the heater coil in heat-mode. Buy a new Heater Control Valve or let us restore yours! 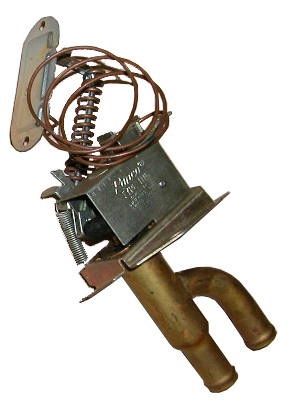 Classic Auto Air carries new heater control valves, we have many NOS & NORS heater control valves. While we do have some of the most common heater coils, many are no longer available. In most cases, Classic Auto Air can re-core your original or we may have a NOS coil available. Please call or email for more information. We offer many NOS & NORS heater control valves for Chrylser, Plymouth & Dodge vehicles and also restoration services for most lever-operated heater control valves. Call or email for more information!